Lark Rise to Candleford, inspired by Flora Thompson’s classic novels, presents a love letter to a vanished corner of rural England in this heart-warming BBC adaptation teeming with wit, gossip, intrigue and romance. Lark Rise, a small hamlet gently holding on to the past and Candleford, its neighbouring market town bustling into the future, both have their own eccentric and beloved characters. When young Laura Timmins leaves her parents..
Lark Rise To Candleford, adapted from Flora Thompson’s memoir of her Oxfordshire childhood, presents a love letter to a vanished corner of rural England and a heart-warming drama series teeming with wit, wisdom and romance. Set in the Oxfordshire countryside at the end of the 19th Century, this rich, funny and emotional series follows the daily lives of farm-workers, craftsmen and gentry in two contrasting communities: Lark Rise, the sm..
Own Lark Rise To Candleford Series 1 to 2 DVD from Deff, DVD, Blu-Ray & 4K Video Specialists - Free UK Delivery..
Own Lark Rise To Candleford Series 1 to 3 DVD from Deff, DVD, Blu-Ray & 4K Video Specialists - Free UK Delivery..
Late 19th Century life in the small Oxfordshire hamlet, Lark Rise, and its neighbouring market town, Candleford, continues to throw up secrets, confrontations and romance in a heart-warming second series that includes a feature-length Christmas special and 11 new episodes. Rich, enterprising and worldly, one-time Lark Rise boy James Dowland arrives from London intending to put Candleford on the map. However, it isn't long before he is s..
More secrets, drama and romance in the hit BBC series. The heart-warming and beautifully shot drama series returns with more delightful comedy, intrigue and romance from the late 19th Century hamlet of Lark Rise and its prosperous neighbouring town, Candleford. When Daniel Parish, a handsome and ambitious young journalist arrives in Candleford, it seems that the fortunes of the Timmins family are about to change. But would the family re.. The heart-warming and beautifully shot drama series returns with more delightful comedy, intrigue and romance from the late 19th Century hamlet of Lark Rise and its prosperous neighbouring town, Candleford. When Daniel Parish, a handsome and ambitious young journalist arrives in Candleford, it seems that the fortunes of the Timmins family are about to change. But would the family really want a move to Candleford and is the stranger all .. Continuing the popular and heart-warming BBC series, based on Flora Thompson's memoir of life in late 19th century rural Oxfordshire. This charming series set in a small hamlet and its neighbouring town sees the return of favourite characters such as Dorcas, Laura, the Pratts, Alf and Minnie - and a fond welcome home for Alf's mother, Caroline. 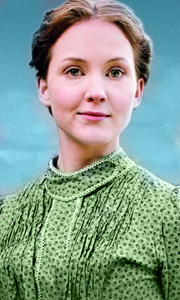 Candleford has a new arrival in Gabriel Cochrane, the handsome and once wealthy owner of a la..